Si-Tex’s 1010CF with External Antenna offers a powerful GPS/Sonar combination which is easy to operate and provides top notch performance. A 10.1” color display, External GPS Receiver, Dual-Frequency Fishfinder and included Navionics Nav + Mapping. The SVS-1010CF is combination chartplotter fishfinder from Si-Tex that will fit most boats and budgets. This large screen 10.1” Color LCD has brilliant LED backlighting so it can be read in most lighting situations. Packaged with an External GPS antenna that quickly and accurately locates position and a built-in 600W dual frequency sounder for fishfinding. This large screen unit will work in most boats from a center console skiffs to sailboats and will provide both with solid performance whether they are looking for fishfinding or guidance as their primary purpose. The SVS-1010CFE has the ability to read both C-Map and Navionics charting. It comes with Navionics Nav + for North America but if you prefer C-Map you can simply add their charting on an SD card to the card reader of the 1010CF. The SVS-1010CFE has an extremely large memory capable of holding up to 20,000 of marked and named waypoints and a track log of 50,000 points with 100 routes of 20 waypoints each. The dual frequency 600 watt sounder of the SVS-1010CF can be mated to a 50/200 kHz transducer that will provide the angler with a frequency (50 kHz) to use in deep water and a frequency (200 kHz) to use in shallow water and at a greater speed, or simply just display and use both frequencies at one time. If you are looking for a simple to use and install large screen color chartplotter/fishfinder that will not break the bank then the Si-Tex SVS-1010CF with either internal or external antenna is a great option to consider. 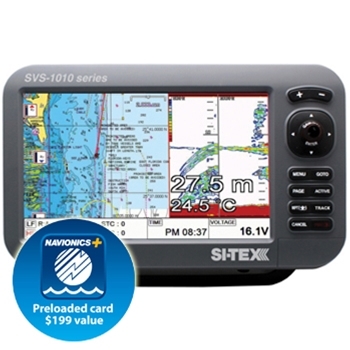 Each Si-Tex SVS-1010CFE comes with:Si-Tex SVS-1010CF, External GPS Receiver, Navionics Plus Chart Card, Sun Cover, Mounting Bracket, Knobs, Power Cable, Fuse & Bolts, Manual and a Two-Year Warranty. Si-Tex’s 1010CF with Internal Antenna offers a powerful GPS/Sonar combination which is easy to operate and provides top notch performance. A 10.1” color display, built in 52-Channel GPS Receiver, Dual-Frequency Fishfinder and included Navionics Nav + Mapping.